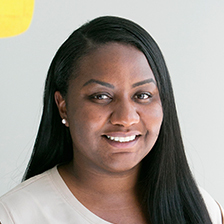 Jasmine Hall is CompassPoint’s operations manager. She is responsible for leading day-to day operations of the office and leading the human resource and customer service functions of the organization. Over the past decade, Jasmine has teamed up with a number of community-based organizations to make change in Oakland. Her last position was project coordinator for The California Endowment’s place-based initiative East Oakland Building Healthy Communities. In 2015, Jasmine worked with The Golden State Warriors Foundation and Oakland Parks and Recreation on a community basketball court refurbishment project at Rainbow Recreation Center in East Oakland. She has also partnered with YMCA Eastlake, Moving Forward Education, Oakland and Berkeley Unified School District, and Oakland Public Library. Jasmine studied Sociology at San Diego State University. Upon her return to the Bay Area, she obtained EMT Certification through the Bay Area Youth EMT Program. She also volunteers as an EMT instructor at BAY EMT and continues to dedicate countless hours to under-served communities in Oakland.